For all of us professionals who made the mistake of getting a college degree instead of learning a skilled trade, over the course of a long career we face many decisions about which roles with which organizations will be most rewarding–however you choose to measure rewards. 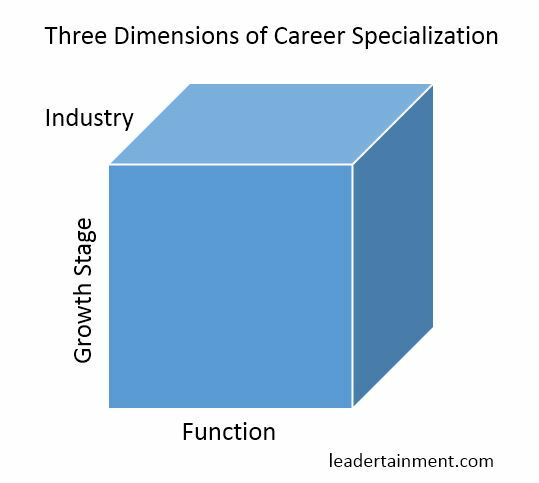 Once you’ve chosen which of the four job types is for you, at some point in your career you will begin to specialize. If you’ve reached the point in your career where you’re wondering what’s next and preparing to transition to a new role, think about the dimensions below. Sometimes deciding what you will not do next can simplify the search for what you will do. Function: by choosing a functional area (e.g., operations, finance, sales, etc.) of expertise, you can bring best practices across industries. Industry: deep knowledge of a single industry (e.g., B2B software, upstream petroleum, auto insurance) is an asset that allows you to move between companies or functional roles. Growth stage: the problems that confound businesses trying to break above $10m in revenue are very different from those at the $1b revenue threshold. There are many stages of growth (e.g., expanding to a second country or continent, going public or private, etc.). Building a track record of success in one of these dimensions will lead to flexibility in the other two dimensions as organizations that require your expertise will seek you out as a valuable asset. I’d be thrilled if my daughters grew up to be welders, plumbers, or electricians. If they don’t I hope they at least read my blog as they navigate their professional careers. Thanks to Bernardo Menezes for sparking this idea. Next Post Hold on, were you just trying to delegate?